"A Cool Breeze" is how this unit has been described! This Condo is perfect for families! 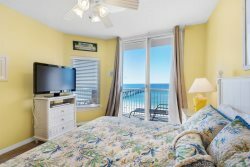 There are views of the Gulf and also views of the sound from the wrap around balcony of this corner unit. It has everything you need. After taking in the sea air, you can sleep comfortably in the master bedroom with a king bed, the second bedroom with a queen bed, or the third bedroom with two doubles. There is also a sleeper sofa in the living room to comfortably sleep 10, but if you need more room for extended family members or another family, consider renting this unit and the 1 bedroom unit next door (SW 504 E) at the same time. We enjoyed our week at Summerwind! One improvement would be to heat more than one pool. When only one pool is heated it makes for a crowded pool and pool deck. Nice place! Very clean! Very affordable! Booked another room for when we come back in July. great location and loved being right next to the pier! Super friendly, helpful, and efficient staff. It was very clean, has tons of room, decorated nicely and has a spectacular view! It's a perfect place to stay. My family and I plan on staying here every year!